Florida’s back in the news again. 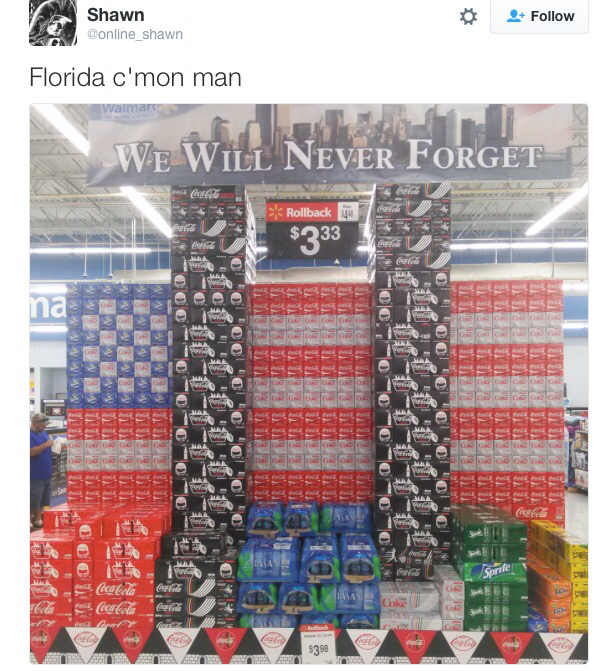 This time people are furious after pictures of a Florida Walmart’s 9/11-themed Coke display began to circulate on Twitter Tuesday afternoon. Twitter user Shawn Richard Tweeted a picture of the display, which presented Coke Zero in place of Ground Zero and spurred thousands of angry retweets about the beverage company’s marketing ploy. According to Orlando Weekly reports, the display has been taken down and that Walmart initially approved the design. Personally, I don’t consider the display grotesquely offensive, but who asked me.